Subway Series Wrapup: Get out the brooms! Squawker Lisa, I see you somehow can't find the time to write about your Yankees. So let me help you out. The Yankees were swept four straight games. The same Mets who had lost 25 of their last 36 games. The Mets who had lost five of their last six going into the Subway Series, allowing an average of five runs per game. The Yankees scored a total of seven runs in the Subway Series. The Mets set a team record for most strikeouts in three games without a walk over the last three games - 34 strikeouts and zero walks. Matt Harvey pitched only one of those games. The other two were pitched by Dillon Gee and Jeremy Hefner. After beating the Yankees in the Bronx, Gee's road ERA is down to 7.76. Hefner's road ERA is down to 6.11. Ike Davis had four RBI in the series. He has one other RBI in May. The Yankees are now 11th in the American League in runs scored. Their pitching has carried them so far, particularly the relief pitching. The Yankees' top two relievers, Mariano Rivera and David Robertson, both suffered losses in the series. But don't worry, Lisa, Mark Teixeira and Kevin Youkilis are returning! Sure, Teixeira generally forgets how to hit in his first month of the season. And Youk, who was so-so in April, should find a way to get back on the DL before too long. Meanwhile, Lyle Overbay will probably have to leave the lineup despite being second on the Yankees in RBI. So I can't blame you if you decide to take a well-timed trip to the DL and ease your way back in to having to write about the Yankees by blogging on flat ground. Also, does this mean that we can cancel the "Brian Cashman: Supergenius" award that the media has been ready to give Cash all season? Just wondering. Anyhow, I will let Squawker Jon have the floor to do the Snoopy Dance, and will silently fume until I can speak in the blog! The Mets clinched the 2013 Subway Series with a 9-4 thumping of the Yankees. It was only the third time since May 3 the Mets had scored as many as five runs in a game. Look on the bright side, Squawker Lisa - at least David Phelps got more outs than Mariano did on Tuesday! Jeremy Hefner was 0-5 going into the game, including two losses to the lowly Marlins. The Mets were 0-10 in games Hefner started. When the Mets scored five runs in the top of the first, I figured it would be one of those games in which the Yankees would come back with several runs of their own in the bottom of the first. Instead, Hefner allowed just one run through five innings before giving up a couple more in the sixth. Even the cheap Yankee stadium homers are bouncing the Mets' way, with Marlon Byrd hitting one off the top of the right field wall. So much for the Yankees' current roster of castoffs and fill-ins massively overachieving. But at least the Yankees do have Mark Teixeira and Kevin Youkilis expected back on Friday in time to face the Red Sox. What, Squawker Lisa, not rushing them back tonight to try to prevent Dillon Gee from completing a sweep? Gee is 2-6 with a 6.34 ERA this season. His road ERA is 9.97. I'm not really sure who Vidal Nuno is, but he does have a 1.93 ERA in 14 innings so far. So the Yankees should have a good shot at avoiding a sweep, but this Subway Series has clearly defied predictions so far. Let's Go Mets! Four years ago, I stumbled out of Yankee Stadium surrounded by Yankee fans celebrating their team's unbelievable comeback courtesy of Luis Castillo's dropped popup. Squawker Lisa was, of course, celebrating as loud as anyone. Last night, I got some payback. Once again, the home team trailed in the bottom of the ninth and appeared certain to lose. The closer was 18-for-18 in save opportunities; in 2009, the closer was 16-for-16. But this time the closer was not Francisco Rodriguez, but the incomparable Mariano Rivera. And he was facing a lineup that looked as if it would have trouble competing in the between-innings kids' homer contest in Kiddie Field. But this time, I was the elated one who still has trouble believing what I just saw, while Lisa was the one gritting her teeth on the subway. And no, I still don't believe it. It happened so fast. Our seats were so far from home plate that you had to squint to see the ball. And the greatest closer of all time was on the mound. As if going to the Castillo game wasn't bad enough, Lisa and I also went to the 2009 Subway Series game two weeks later when K-Rod walked Mariano with the bases loaded, giving Rivera his only career RBI, and Mariano picked up his 500th career save. The Mets later sent Mariano the pitching rubber from that game. I can't think of another Yankee I admire and respect as much as Mariano. I cheered him when he threw out the first pitch before last night's game. But I had no desire to see him add to his MLB career-best saves total. And Matt Harvey, brilliant again, get tagged with his first loss, especially at the hands of the Yankees. Instead, the Mets beat the best. And I still find it hard to believe! 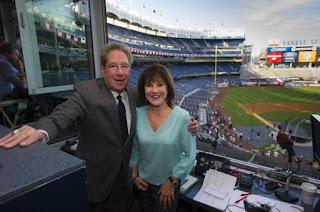 Sorry, but last night's game was a bit of a snoozer (and no, that wasn't just because my Yankees lost.) It just wasn't all that exciting, even for a Subway Series game. We have been hearing for years about how the Yankees and Mets players don't really consider the Subway Series any different from other games. In those times, they seemed to be putting a damper on the hype. This time around though, this series really doesn't feel very special. The only real excitement you could see/feel in the ballpark that translated to watching at home was courtesy of the 7 Line Army -- the group of Mets fans who had batches of seats together in the outfield, and all wore the same shirt. By the way, there was a nice article about Darren Meenan in Capital New York this week, but of course, some jealous Mets fans ripped into him in the comments section, just because. Squawker Jon, I thought the why Mets fans acted like crabs keeping their fellow crabs from exiting the bucket! Anyhow, hopefully tonight will be a bit more interesting. It certainly should be, since not only is it a Matt Harvey/Hiroki Kuroda matchup, but Squawker Jon and I will be there in person! If tonight isn't a sellout, though, it will not bode well for the Subway Series in the future! 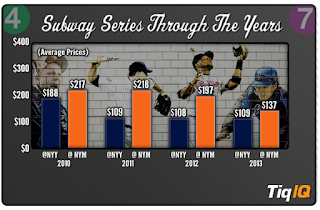 With a combined average price of $116, this is the cheapest Subway Series over the last four years. This year's combined average price is down 6% from 2012, 3% from 2011, and 41% from 2010. 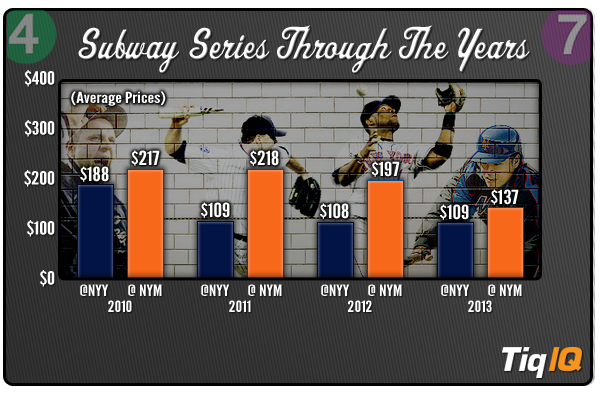 This years most expensive Subway Series game is Game 2 at Citi Field with an average of $140. The cheapest secondary-market ticket the series is $28 with fees for the final game at Yankees stadium. The least expensive ticket in Flushing is $29 for the opener on Monday. The premium over the regular season average for Mets tickets for this year's series is +67% compared to a +140% premium last season. The premium over regular season average for Yankee Ignore warning s tickets for this year's series is +9%, compared to a +20% premium last season. When Brett Gardner pulled an Endy Chavez and robbed Daniel Murphy of a two-run homer, the Mets appeared headed for another ignominious defeat at the hands of the Yankees. But the Mets overcame Gardner's play of the year, thanks to David Wright's game-tying homer and Murphy's game winning hit. Jon Niese lowered his ERA to 4.40, which is pretty good considering it was 5.93 on May 11.Bobby Parnell picked up his fifth save in May. The Mets knocked the Yankees out of first place tonight, and now they go for a Citi Field sweep with Matt Harvey making his first start against the Yankees. Hiroki Kuroda has faced the Mets three times at Citi Field and is 0-3 with a 6.19 ERA. He also lost his only start at Shea Stadium, allowing six runs in 2 2/3 innings. All of these starts came when he was with the Dodgers. The only current Met to homer off of Kuroda is Davis. Squawker Lisa and I are going to the game.We've already seen Harvey win once this season and I'm hoping he can continue to show that the most exciting young player in the Subway Series is a member of the Mets. I laughed when the Yankees acquired Vernon Wells. I chuckled when they signed Travis Hafner. I guffawed when they grabbed Lyle Overbay after the Red Sox cut him. Turns out all three "has-beens" are outhitting most of the Mets' pathetic lineup. And the Yankees are tied for the third-best record in baseball while the Mets have the third-worst. At least the Subway Series is only four games this year. Fortunately, when Squawker Lisa and I bought our Subway Series tickets before the season (another wrong prediction - that these games would be in demand), we ended up with tickets to the game Matt Harvey is pitching. Other than that, reasons to watch the Mets include Rick Ankiel, who was cut by the Astros, a team bidding to outstink the 1962 Mets, Ike Davis, whose two hits Sunday night matched his total since May 10 and John Buck, who continues to lead the Mets in homers and RBI by wide margins even though he's come back to earth in May, hitting .209 with two homers. Fortunately, we are going to the Harvey game. This was supposed to be a year when the Mets added Zack Wheeler and Travis D'Arnaud to a promising core. Now, by the time the prized prospects get to Flushing, there may not be much of a core to build on, judging from the performances so far this season of Davis, Ruben Tejada and Jonathon Niese. At least David Wright continues to excel and Daniel Murphy and Bobby Parnell are doing well. But when I find myself wondering if the Yankees will release Overbay after Mark Teixeira comes back so the Mets can scoop him up, something is very wrong.